Integrated Sensor Interface reduces cost and enables ultra-low power design. To be very easy to implement. The Radiocrafts sensor board, that supports includes the supported sensors and is a great tool for prototyping a wireless Sensor network. The base-stations is the xSM Wireless Sensor Network (WSN) is divided in two categories. The MSM modules are based on Wireless MBUS and can connect to any Wireless MBUS gateway that supports either 169MHz or 868MHZ. 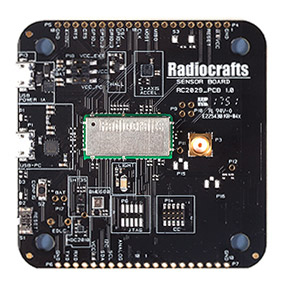 Radiocrafts also offer IoT expansion boards that can interface to the MSM modules and can be easily integrated into a FX-30 Gateway from Sierra Wireless or a MangOH Red board. Radiocrafts provides the source code to the demo software used to connect the sensors to the cloud. An analog interface that reads the voltage level between 0 and 1.25V, in steps of 0.01V, from a sensor. Digital GPIO, that can be configured for input or output. As input it supports sensors with digital output, such as many magnetic sensors. The I2C interface supports a variety of predefined sensors. See the Data Sheet for details. The SPI interface supports predefined sensors. See the Data Sheet for details. An event controller inside the Radiocrafts module determines when a sensor is read and when data is transmitted to the wireless network. The sensors are read by using either a time cycle, where the cycle time is decided by the user at configuration or by hitting a trigger condition that can be configured by the user. The transmission to the network is set in a similar fashion, either where data from the module is sent at a customer-defined time-interval or when a trigger condition is met. See the User Manual for more details. The sensor board supports the development of Sensor nodes using Radiocrafts Sensor Interface modules. It is included in the development kits for those modules. The Sensor Board is populated with the sensors in that table below.